Does EVERY member in your household want the new puppy? Bringing a new puppy into your home is a family project in which everyone in your household must be willing to share in the responsibilities. Too many times rescue groups and shelters have to take dogs in because a spouse or other family member has said, “This dog has to go!” If not everyone in your household is open to the idea of adding a puppy perhaps the time just isn’t right. Thinking a spouse or other member of the family will, “Get used to the idea” is not going to give this puppy a loving and stable home in which he will be a new member of the family enjoyed and loved by everyone. A reputable breeder will need to be sure that your entire family is ready for this and may ask to meet with everyone. If you rent your home, be sure to have written permission from your Landlord before purchasing or adopting your new pet. This could save you a lot of heartache later if you learn a dog will not be allowed in the home. Have you researched your breed of choice? It is very important to know and understand the characteristics and traits of the breed you have selected. Purchase breed specific books, visit your local library, talk to people that owns this breed of dog. 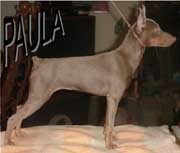 Attend dog shows to see this breed and others in action and talk to breeders/owners that are familiar with the breed. Pay close attention to the special requirements your breed may need regarding feeding, housing, training, and grooming. Once you have done this, stop and ask yourself if you have the time and the means to devote to this breed. Every breed is different and requires different types of living conditions and care. Some breeds need large amounts of room for daily exercise, some require higher than average grooming attention, some shed heavily all year long, some are prone to excessive barking, some are not recommended around small children. Leave your options open when you are considering what type of breed will best fit into your lifestyle and living arrangements. If you live in an apartment a Border Collie would not be the recommended breed for you. If you are an avid jogger and want a running buddy, a Basset Hound should not be your breed of choice. When you are first researching for a breed that will work best for you keep your mind and options open. I strongly suggest starting with some books to learn more about Miniature Pinschers, here are only a few that I highly suggest before you make your pet purchase or adoption final. A Miniature Pinscher is for me! You’ve done your research, you’ve purchased books, you’ve visited dog shows and you have decided, a Miniature Pinscher is a breed of dog that your family agrees on and will work wonderfully well in your home. Now the real work begins, it’s time to dive into the mind and soul of a Min Pin and understand what adding a min pin to your family will really mean. You are about to enter the most fun filled, entertaining years of your life once this little Court Jester is brought home. Miniature Pinschers are classified in the toy category simply because of size. Their attitude can be compared with the giants of the dog world. 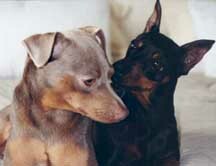 Miniature Pinschers or Min Pins are an animated dog that chooses to enjoy life to the fullest. With their high-stepping Hackney gait, comical out look on life and nothing less than quizzical personality creates a dog that will demand attention wherever they go. Throw in a stubborn streak that sometimes doesn’t know when to stop with their clown like antics, rest assured it takes a special person to call the Miniature Pinscher their breed of choice. 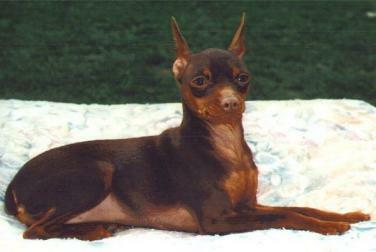 Min Pins come in a variety of colors, Red, Stag Red, Black/Tan (rust), Chocolate, Blue and Fawn. Both Blues and Fawns are considered disqualifying colors and not allowed to compete in AKC conformation competition at this time. However, at no time should Blues or Fawns be considered or sold as a “Rare” color. Avoid any breeder that advertises them as rare or charges more for these colors. 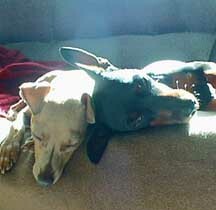 Hope: Owned by - Terri S.
Paula: Owned by- Georgette C.
A Min Pin is a small dog in body size. 10 inches to 12 1/2 inches in height, with desired height 11 inches to 111/2 inches measured at highest point of the shoulder blades. Disqualification occurs when a Min Pin is under 10 inches or over 12 1/2 inches in height. Length of males equals height at withers. Females may be slightly longer. A Reputable breeder strives to remain within this set standard, any breeder producing Min Pins that are extremely over-sized or extremely under-sized or advertise under-sized Min Pins as rare should be avoided. Millie Owned by: Cathy B. It is believed that the Min Pins originated in Germany in the late 19th century and although they do closely resemble a smaller version of a Doberman Pinscher fact is the Min Pin is the older of the two breeds and other than both being canines the relationship ends there. 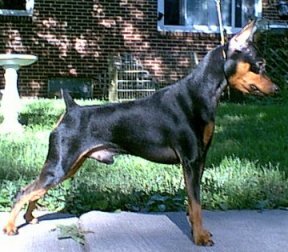 Development of the breed as we know it today began in 1895 when Germany’s Pinscher Klub began and set the first standards for the breed. Evolving from an ancient breed of Pinscher family of dogs, which incidentally are the same line of dogs that led to many of the breeds we know today and working with both Dachshunds and Italian Greyhounds has for the most part is been the deciding factors in producing the Miniature Pinscher (Zwergpinscher) although with research you will find this is still debated by many. The breed was known in Germany as the “Reh Pincher” because of a close resemblance to a small red deer of the same name that once roamed the wooded areas of Germany. 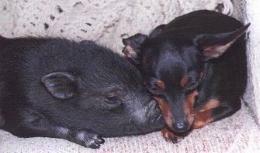 The Miniature Pinscher’s main job was to work on farms and in barns ridding the grounds of rodents. The instinct and ability to catch rodents can still be seen in our pets with their cat like fast reflexes. 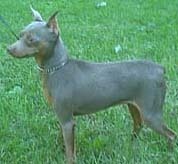 Around the time of 1919 Miniature Pinschers began showing up in the States with the first real interest in the breed in the show ring starting around 1928. 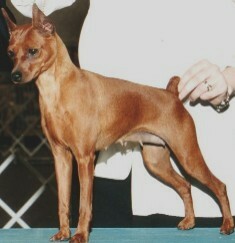 Prior to 1929 when the Miniature Pinscher Club of America was started the Min Pins were shown in the ring under a miscellaneous class. Today the Miniature Pinscher is not only a natural in the show ring demanding attention at once, they are also wonderful family pets that can adapt to nearly any living situation. From holding his own on a farm to living quite well as an apartment dweller a Min Pin can easily call any place home when proper requirements are met. Min Pins also do well in a home where he is not the only min pin. They adore the company of others. Whether your looking for your first min pin or a second or third min pin you will find that these little characters are just a joy to be with and having more than one only adds to the fun. Sometimes their best friend isn't always another min pin. You have taken this much time researching different breeds the next step is just as important. Research Breeders and understand why it is so important to Only work with a Breeder that is reputable with the breed and takes every needed step to ensure a healthy puppy that will give you years of loving enjoyment. We will now move on to the next section of this site. Website & Graphics created by Terri Snider. Copy or Reproduction of Material or Graphics is not permitted. We at MinPinTalk DO NOT endorse, agree with, or Support any adds appearing at the top of these pages or below that advertise the selling of dogs/puppies. Those banners are put there by Tripod in exchange for a free service they provide. We strongly OPPOSE Puppy Mills, Brokers, Pet Shops, Back-Yard breeding and ALL irresponsible selling of dogs and puppies.